Remove tops and core mini bell peppers. Slice into thin strips. Remove pits from apricots, then finely slice. Cut chili into fine rings and finely dice onion and one third of the garlic. Leave the skin on the remaining garlic cloves, crush slightly with the blade of a knife, and set aside. Heat olive oil in a small pot and sauté the onion, garlic, and Piment d'Espelette. Saute gently until translucent, approx. 5 min. Add the bell pepper, apricot, and chili to the pan and continue to sauté. Continue to sauté, approx. 2 min. more. Deglaze with white balsamic vinegar. Let simmer approx. 2 min. Add sugar and simmer for a few more minutes. Season with salt and remove from heat. Use paper towels to pat the flank steak dry and salt both sides well. Heat vegetable oil in a frying pan set over high heat. Add flank steak and fry on each side approx. 3 min. Reduce the heat to low, add butter, crushed garlic cloves, and thyme and continually baste for approx. 2 min. Remove steak from frying pan and let rest on a cutting board for approx. 4 min. Stir pan juices into the chutney. 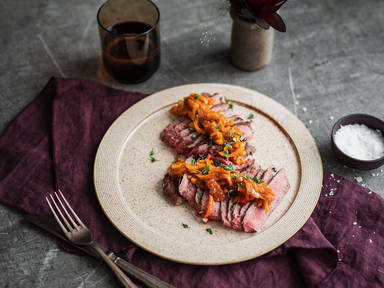 Slice the steak into thin strips, across the grain, and serve together with the bell pepper relish. Garnish with fresh thyme. Enjoy!